Just in time for the 10-year anniversary of Hurricane Katrina, the Orpheum, the historic theater that flooded after the storm and has remained shuttered since, will have completed a $13 million restoration. In 2014, Roland von Kurnatowski, owner of Tipitina’s and the Tipitina’s Foundation, along with Dr. Eric George, bought the theater for $1.5 million and embarked on a project to restore theater known for its acoustics and its signature tenants: the Louisiana Philharmonic Orchestra. At the end of August the theater will host small events to open the space, but the big event is on Sept. 17, when the theater will host the LPO’s “Return to the Orpheum” concert. 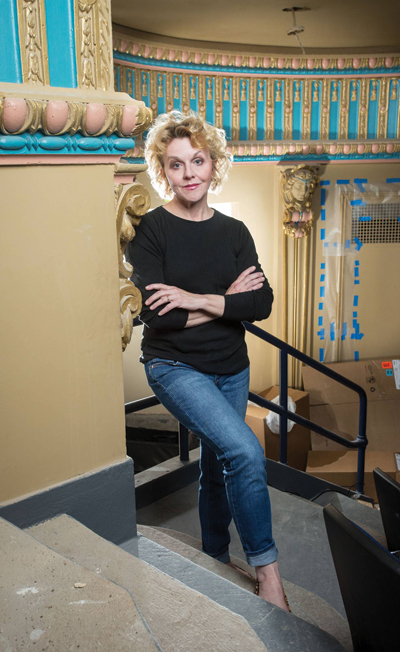 Mary von Kurnatowski, Roland’s wife and Tipitina’s co-owner, has volunteered as the role of decorative artist of the restoration, using her skills as a painter to uncover what’s been hiding under sheetrock for nearly a decade. What kinds of things about the restoration of the theater have been surprising, challenging or exciting? It has been an amazing, and exhausting, experience. … I’m not a big fan of heights, and to spend 10 weeks 65 feet above the floor to paint the ceiling was definitely a new and different – read: terrifying – experience. By the time the ceiling was finished, I was actually pretty at home up there. It is certainly a different and spectacular view. What are some of the aspects of the theater that you wanted to keep and restore to their former glory, and what things needed to change to fit in with modern needs? Clearly some things needed to be updated, like electrical, HVAC, lighting, hospitality areas such as bars …. and of course, this theater has always been known for its fabulous acoustics. Great care was taken in that area to make certain that would still be the case. A lot of detail went into the finishes, especially the paint colors and application. I spent over three days collecting paint samples directly from the walls and the ornamental plaster. It was difficult, to say the least, to get samples of the paint colors large enough to have the custom color matching done, but eventually that happened. Then I spent several more days photographing every detail of the building so there would be a record of what colors went where. What are some of the new features of the theater you’re excited about? The most exciting new feature has to be the moveable floor that Roland, Brett Olive and Jim Elder designed and fabricated. The floor can be lowered for performances or it can be raised to have a level surface from the stage to the lobby in order to have a seated dinner. The flexibility is a beautiful thing. (With this project) I’m completely hands-on. I think I’m basically a construction worker at heart, just with lipstick and Chanel No. 5. And a lot of tiny paint brushes. Visit OrpheumNola.com for more information.